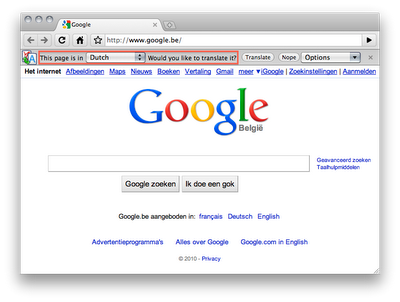 Trust the HTTP Accept-Language request header and serve the page in English. Notice that the request was originally sent to google.com and serve the page in English. Notice that the originating IP address is from Brussels, where 85% of residents are French-speakers, and serve the page in French. If request is made during working hours, acknowledge that the user isn't especially likely to live in Brussels proper, and pick at random between Dutch, English or French. Alternatively, you could ignore the fact that good solutions even exist, rest on the fact that 59% of Belgians speak Dutch, and use this as an opportunity to plug your browser's translation service.